Hello! This is my first Redux of a RP. I played this since the first time it started, and I thought it sad to see it die in the Redux. So, I decided to bring it back! The old redux introduced a New Region for players to enjoy, so there's that to! The world of pokémon... 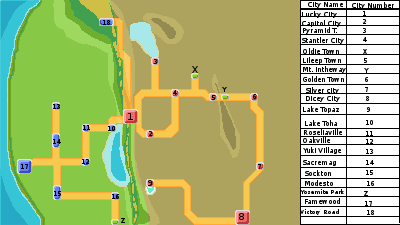 If you're only just starting out, here, there are a few things you will need to know, such as how the entire population of Castelia City was changed into various pokémon thanks to Reinh Kaa, a warrior from an ancient time who tried to take over the modern world, twice, and was stopped, twice. Also, perhaps the fact that there's a new region...or, a region that is now official with a lab, gyms, and even a league. The "new" region is called Nevidia, it is split in two, both gym/citywise and environmentwise... the western half of the place is very lush, humid, and green whereas the eastern half is very dry and deserty. The starting city, Lucky City, is in the dead center of all of this, and is neither desert, nor foresty. This region was founded, or, made official by the new Champion of Unova, Robert, a former human... former humans are usually created by the mad scientists under Professor Gerrard, who is still at large. Now that we have that out of the way, would you like to join, or start? Also... NO adding stuff from the anime... this is based on the game, not the anime. Also check out my other RPs: Herobrine. Universal Pardox. And also the old Redux. This is my first RP here. I think i will enjoy RPing. Bio: I was born in Rustboro City. I have attended the Trainer School since I was 6. My dad works for Devon Corp. and my mom works at the Poke Mart in Petalburg. Also, I have traveled all around Hoenn. One of my favorite destinations is Mossdeep city. The research done at the Space Center fascinates me. Lastly, I LOVE Pokemon. Emma might be dead or have left me..